The Red Tail Ridge 2008 Dry Riesling I reviewed a while back was one of the best dry rieslings I tasted over summer, showing great balance while also delivering depth and focus. That balance is on display in winemaker Nancy Irelan's Red Tail Ridge 2008 Semi-Dry Riesling ($16) too, with even more length. Juicy, dripping-down-your arm peach and pear fruit flavors mingle on the nose with notes of Golden Delicious apple, lime and river rock in the background. Apple, peach and lime highlight a fruity, forward palate that shows great acidity. The finish is long, bringing subtle grapefruit character and pear skin. Because of the sugar-acid balance here, I'd expect this wine to have good aging potential in your cellar. It's raining outside this morning and it's supposed to do so on and off for the next few days. With rain arriving just as the red wine harvest was about to begin, it's hard not to remember 2005 when some local vineyards were soaked with twenty-plus inches of rain over the course of eight days -- after a near-perfect summer. We're not getting that kind of rain this week, but growers and winemakers are still spending a lot of time watch weather reports and staring doppler radar. I've found 2005 reds inconsistent and the variation often related to when the fruit was picked. Some stopped picking whites to get at least some reds in before the storm hit. Others rode the storm out and were the beneficiaries of brisk, drying winds in the days after the storm passed. Those who were able to persevere through the storm best made the best wines, like this Wolffer Estate 2005 "Lambardo" Merlot ($35), made from fruit picked on October 17 and 18. Intense and ripe on the nose, this blend of 77% merlot, 18% cabernet franc and 5% cabernet sauvignon, shows blackberry and black cherry scents with hints of fig, chocolate-covered blueberries and an earthy-graphite edge. Mouth-filling and plump -- but with good structure -- the palate is dominated by dark, brooding fruit with layers of cocoa bean, wet earth, fig and well-integrated, toasty oak. Balanced acidity and ripe, round tannins point to good development in the cellar and give way to a lengthy, supple finish of fruit and fig. By the way, this is more or less the wine that used to be labeled "Estate Selection Merlot" before the portfolio rebranding in 2005. If there is a more loaded, more controversial, more debated word in the world of wine than "terroir," I don't know what it is. Well, perhaps you could argue that "natural" can provoke such conversation, but that's about it. The Old World, roughly defined, tends to view terroir with some propriety. The New World seems determined to ignore the word while simultaneously establishing that we, too, can produce wines with a sense of place. Wines with "somewhereness," as the great writer Matt Kramer once said. So if you prefer, we can scrap the usage of terroir for now, but what we're after is whether New York is making wines with a hallmark of their origin. You might not care about this, but it is vital to a region's development. Think of this as my own entry into the "What New York Wine Needs Now" series. And here's my answer: No, most of the time New York is not producing wines with a true sense of place. But -- and here's the most important part -- Yes, that is indeed happening in certain places with certain varieties, and when it does happen, it is inspiring. Have I been reading too much Terry Theise? Maybe, and a book review is coming. But this is a conversation that needs to be had, and the conclusions need to be shared beyond the borders of this state. I'm going to establish some ground rules, and you might not agree, but these are the ones with which I view this debate. First, a sense of place only comes from the right grapes for a particular place. You can have gorgeous and ideally suited land and soil, but if you grow the wrong grapes, you're going to get banal wines with little character. Second, the most effective approach is the one that is as natural as possible, but we are not absolutists. Wine is a product born from intervention, and we do not exclude the hand of man in winemaking discussions. Wines can show a sense of place even after man's work in the vineyard and winery. Third, we will never stop learning. Yes, the Bordelais had centuries to flesh out their ideal sites for merlot, and cabernet sauvignon. But the moment you abandon the search for new answers is the moment you limit yourself in expressing the land on which you stand. Even the Bordelais should be seeking higher understanding. Finally, imitation is the sincerest form of mediocrity. The last decade has seen Finger Lakes vintners stop invoking Germany, while Long Island vintners more rarely invoke Bordeaux. Good. Terroir is not about trying to show how close you can come to somebody who's already doing something at a high level. Terroir is about discovering and exposing what your land has to say, warts and nuances and idiosyncrasies and all. Does all of this sound a bit hokey? That's okay if it does. But if you're not thinking about a wine's sense of place, you're missing out on the intellectual aspect of the experience. And haven't we learned that pure hedonism is boring in life and in wine? I'm not going to break new ground when I say that riesling is the right grape for the region. But I'd like you to think about why that is. Think about how riesling from the Finger Lakes compares to riesling made around the world. It is not as rich and fleshy as most of its Mosel counterparts. It is bracing and often dry like Austrian riesling, but the flavors are different. Why is that? The best Finger Lakes rieslings are nervy, racy, and fresh -- even with some residual sugar. Newcomers to Finger Lakes riesling often find it to be an adjustment. This is a good thing. The wine is challenging them to think of riesling in new ways. It is providing a pleasurable drinking experience -- alongside food, we hope -- but it is also speaking about the Finger Lakes in general. Consider common descriptions. Newcomers will occasionally use the word "severe" to describe the natural acidity in a Finger Lakes riesling. And what is the challenge in making wine in this region, if not severe? What are the slopes on the bottom parcel of Sawmill Creek vineyard, betokened by shale and other stone, if not severe? What are the rough winters, the annual swings in weather patterns? "Severe" sounds like a pejorative until you consider the badge of achievement it represents. Of course, these newcomers tend to evolve in their thinking of Finger Lakes riesling. What was once "severe" becomes "electric," "crisp," "fascinating," even "balanced." This is not the same model of balance that we see in, say, California, nor should it be. These are wines with pure fruit flavors that just so happen to match the fruits grown across the region: peaches, apples, and the like. These are wines with secondary nuances that seem to channel the land, even though there's no scientific evidence they're doing anything of the sort: a Finger Lakes riesling might show vivid fennel flavor, but not because it's borrowing that flavor from a physical thing, right? And Finger Lakes riesling has an undeniable stony core, a combination of river rocks and fresh gorge water and slate and shale -- all the things that we sort of know, and understand, but can't quite explain. They're not volatile, generally, so how do we know what those things smell like? And how the hell did they get into the wine? Yes, I'm the writer who urged my colleagues to abandon use of the word "minerality" in describing wine. You'll notice I've not returned to that word myself in the past year. I prefer specificity, because every wine region has its own minerality, and using the catch-all term tells us nothing about a specific sense of place. But if you'd like to use "minerality" to describe Finger Lakes riesling, I'll know what you mean. That stony core, that complex texture and fresh aromatic quality. It's there. Taking it a step further, that sense of place in Finger Lakes riesling is not only regionally existent, but it can manifest with varying shades based on diverse vineyard sites. No one who enjoys Finger Lakes riesling ought to go without tasting the two Hermann J. Wiemer single-vineyard rieslings side-by-side. In fact, the HJW Riesling and the Magdalena Riesling are the two most important wines produced in the region right now, because they say so much about what is possible when it comes to expressing riesling's sense of place in the Finger Lakes. The first broad step in establishing a sense of place is choosing the right variety and observing its character, but even more significant is watching that regional profile develop while also observing the subtle (and sometimes not at all subtle) differences from site to site. HJW and Magdalena offer the starkest example, as they come from the same winemaker. Wines like Ravines' Argetsinger Vineyard Riesling, or the rieslings of Atwater Estate and Billsboro, enhance the discussion. For a moment, imagine the most bone-chillingly cold, gray winter day. On these occasions it's natural to wonder if we'll see the land come alive again. Maybe you even feel despair. Finger Lakes riesling is the viticultural embodiment of the resilience of an entire region and its people, a kind of Summer-In-a-Glass that reminds us the greens and golds will find their way back. Who has more appreciation for a glorious summer day than a person who spends long months wondering if summer will return? In this lens, Finger Lakes riesling has the vivacity and energy of the local people making the very most of the warm days. The best versions have tension and excitement -- some you might even call over-eager. This is not a coincidence. But what about gewurztraminer, you might ask? What about pinot noir? Cabernet franc, or Blaufrankisch, even? We are not far enough along to say with conviction what is happening with those varieties. But thanks to growers and winemakers alike, we are starting to find out. Let's revisit that question in a decade's time. (Or, really, in a century's time. But barring medical miracles, I won't be around to tell you my thoughts on the answer). By the way, an open and patient mind doesn't mean we can't make some hard conclusions. You can wait forever for a varietal Finger Lakes cabernet sauvignon to speak to you, but you won't hear much. This summer, my wife and I drank through our entire stock of Long Island whites. 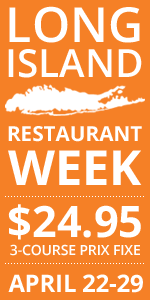 What was telling to us was not simply that we enjoyed the wines and wanted to drink them, but that we often found ourselves saying, "This meal simply begs for a Long Island white." I am not nearly as qualified to write about this subject as my colleague Lenn Thompson. I'll be brief. There is a saline quality to the minerality of Long Island whites that is not only appropriate but beautiful in its demonstration of place. I don't need to wax on about the salty air, or the seafood trade, to make clear what this kind of minerality means to a wine region. In the best Long Island whites, that character is so vivid that I feel transported to the shores and I long for a bivalve companion on my plate. What about reds? I tend to think New World wine regions will always have a tougher time establishing a sense of place with red wines because there is more temptation to allow oak to join the fray (and occasionally obscure it). Having said that, the Long Island merlot I've opened in the past several years has shown a consistency and a unique profile that sets it apart from any other region currently producing merlot. Notice I didn't say this unique profile makes it "better." That nebulous term is probably best abandoned along with "minerality", though I'll argue all day that Long Island merlot is better, as a whole, than California merlot, for example. To me, the unique character of Long Island merlot combines richness without being sweet and acid without being jarring. How many merlots have you had from around the world that were dominated by sweet, gobby fruit? Or perhaps they were soft and chewy - like a damn marshmallow. Long Island's version shows a naturally complex nature, a density that is hard to describe, along with a freshness that makes for a wonderful long-term evolution. I recently read a blog writer who compared Long Island merlot to merlot made in France, and he seemed disappointed. This is like critiquing Morgan Freeman by saying, "Dude can act, but he's got a terrible singing voice. I heard Pavarotti last week, and Morgan Freeman is not Pavarotti." In other words, who the hell cares if Long Island merlot doesn't perfectly match a region thousands of miles away? How is that relevant? Benchmarks matter, of course. But we're not aiming for parity. Other red varieties seem to hold great promise on Long Island as well. If I were a grower I'd rip out pinot and plant cabernet franc and even petit verdot. I'd spend years listening to what those varieties say in that specific place. The story of New York wine is now moving into a definition of its terroir. You don't have to use that term. But with a small group of friends, as you discuss the ways the best New York wine channels its people and its place, we won't blame you if you slip. More fall seasonals are trickling into my local shops, so the search for the best examples continued this week with another opposite-ends-of-the-state comparison: Blue Point Oktoberfest and Southern Tier Harvest Special Ale. I’d heard raves about both from beer friends, so it was amazing to find them as different as they were. Southern Tier harvest pours clear amber into my awesome Old Toad Pub tulip glass from an epic dinner there on Wednesday (stay tuned for that story!) with a delicate head and minimal lacing. The nose is hops. Yup, hops. No nutmeg, no clove, no cinnamon -- if you’re shopping for pumpkin pie spice you’re in the wrong aisle. This is the musty, resiny, grassy essence of primal lupulin -- apparently in Jamestown, “harvest” refers to plants of the not-quite-legal variety. Ready for a big chewy gulp of fall? Think again. A palate-scraping mouthfeel of hop bitterness, unchecked by significant malt sweetness, suggests that this baby has more IBUs than the dustbuster at Lagunitas. There are whispers of nuttiness from courageous malt hints attempting to sing through the chaos, and God bless the little buggers for trying. A harvest ale? Nothing about this beer, besides perhaps the appearance, suggests the style -- but does it matter? Hopheads don’t turn in their cards on Labor Day, and if picking gorgeous cones off your hop vines has made you crave their sweet nectar, this is the “harvest ale” for you. IPA haters, back away slowly. I had to eat a meal in between the beers to cleanse my palate (wild boar -- somehow a great pairing for hoppy ales!). The Blue Point pours a color just a shade darker and with a slightly puffier head into the same glass. Once it hits your lips, though, it’s the polar opposite of Southern Tier. The nose is sweetbread and toffee malt, with hints of Clementine peel and nutmeg. The palate is big, thick, sweet, bready – just the faintest kiss of hops, but no more. To speak in pet store terminology, because that’s what popped into my head, this beer is the cuddly golden retriever to Southern Tier’s annoyed hedgehog. This Blue Point offering, while perhaps just a hair too sweet, sits contently in the Oktoberfest mold while Southern Tier Harvest runs arms-aflail in the other direction like a Ritalin child at Grandma’s house. Do you hold your beer to the requirements of the style it claims to emulate? I tend to, but as “harvest” is more an attitude than a style per se, let’s embrace the originality. Both efforts get a thumbs-up. Back in July when I wrote about a 10-year riesling vertical tasting I attended at Peconic Bay Winery, I described riesling on Long Island as "a bit player, a character actor that will never take center stage in any sort of meaningful way." That is still certainly the case, but for whatever reason (post coming soon) 2009 has proven to be an excellent vintage for riesling on the North Fork, leading to some of the best riesling I've tasted locally. Winemaker Greg Gove has a special affection for riesling and the Peconic Bay Winery 2009 Riesling ($24) very well may be his best rendition to date. The lavish, bright nose shows lovely floral aromas of citrus and apple blossom with just-ripe peach and grapefruity citrus fruit notes. Crunchy, electric acidity balances a burst of citrus fruit -- sweet lime and grapefruit -- on a mouth-filling palate that also delivers floral, peach and almond flavors. The finish is medium-long and decidedly floral and citrusy with a chalky, saline minerality at the very end. Every wine has a story behind it. All too often, those narratives are joyless and dispiriting ones filled with nefarious characters, corner-cutting, over-manipulation and mass-production. Then there are the tales of incredibly meticulous artisans, their dedication and their dillgence. These are the stories than inspire us and drive us to act -- or buy in the case of wine. I've told the story of Roanoke Vineyards Gabby's Cabernet Franc before. It's story of a man, Gabby Pisacano, tending the 12 eastern-most rows of cabernet franc in his son's vineyard. Sometimes the best wine stories are born at a PR agency's conference room table. Not here, I assure you. Gabby is out in those rows nearly every time I drive by the vineyard on my way to and from wine country. To see it to believe. In 2006 -- anything but a banner year for Long Island cabernet franc -- Gabby's long hourss in the vineyard coupled winemaker Roman Roth's deft hand in the cellar resulted in one of the best reds from the vintage. On Sunday, September 26, Roanoke Vineyards will release the Roanoke Vineyards 2007 Gabby's Cabernet Franc ($38) to celebrate Gabby's birthday. Most of the wine has already been sold as futures, but if you stop into the winery at any point this weekend -- Friday, Saturday or Sunday -- it should be available. Ripe and outgoing, the nose displays a combination of red and black fruits with complex, intricate layers of earthy leaf tobacco, bay leaf, mint, caper berry and woodsy spice. Over the course of three days, the fruit first puffed out its chest a bit, and then faded into the background just a bit letting the real cabernet franc-ness of this wine take center stage -- all spice and herbs and earth. On the medium-to-full bodied palate, the fruit is a bit more red than black with bing cherries and sweet red raspberries leading the way. Behind that ripe core of fruit are notes of earthy dried autumn leaves, roasted hazelnuts, bay leaves, salt-cured olives and dark roast coffee. Ripe, fine-grained tannins bring grip and structure, pointing to longevity in the cellar. The finish combines earthy and spicy notes with the most subtle hint of milk chocolate as it lingers. Again, over the course of three days of tasting, these various components moves in and out of the spotlight, with licorice and fennel-type flavors peeking through on day three. There isn't much of this available, but it's worth buying and laying down for a few years. Your patience will be rewarded. Visitors to Long Island's North Fork have been driving right by the McCall family's Corchaug Estate for years -- without even knowing it. Located directly across the road from Pellegrini Vineyards in Cutchogue, the 21-acre vineyard is planted with 11 acres of pinot noir (the region's largest planting) and 10 acres of merlot. Until 2007, Russ McCall sold all of his fruit, but in started keeping some of it for his own McCall Wines label. McCall Wines 2007 Pinot Noir ($24) was made in the Hudson Valley by at Millbrook Vineyards by winemaker John Graziano. Millbrook Vineyards has been buying pinot from McCall for years and continues to do so. The nose is intense and classic, showing bright black berry and pomegranate aromas with a dusting of earthy spice, and light caramel notes. Medium-light in body with fresh acidity, the well-balanced palate brings straightforward, ripe black cherry and strawberry flavors with subtle spicy oak and a long finish that is a bit earthy. "Every competition I judge begins with me or some other chief judge reminding the judges we are there to help consumers find wines to drink." -Bob Foster, director of three wine competitions and judge at many others, clearly disagreeing with Cook in the same discussion thread, after explaining that his thoughts "mirror those of Chris Cook"
Whew. You can see, from the quotes above, that some wine judges and competition directors are fired up over our recent post explaining why we will no longer accept invitations to judge at wine competitions. You can also see that in their criticism of us, they occasionally contradicted one another, leaving consumers to wonder, "So are these events designed to deliver valuable information to us, or not?" No, says Chris Cook. Yes, says Bob Foster. Perhaps, but that's not the main point, says W. Blake Gray. And these men are some of the leading lights of the wine competition circuit. It's hard to blame consumers for being confused. Let's accept Mr. Foster's contention that wine competitions are (at least partially) designed to help consumers find wines to drink. In this post we want to look at an area that most consumers don't think about, because most consumers don't taste dozens or hundreds of wines in a single day (or half day!). Before we delve further, though, let's offer a little self-examination. What did we get wrong in our original post? Plenty! It was our intention to explain to our readers why we no longer intended to accept invitations to judge at large-scale competitions. But Howard Goldberg was right: Who the heck are we, anyway? The post should not have been about us and our decision. That was a silly mistake, and I don't blame wine judges and competition directors if they took it as perhaps a bit arrogant. We apologize for that. Also, Dan Berger wrote, "The long, curious article had some vague criticism of all wine competitions as if they are all the same." He's wrong about the article being vague -- it was highly specific, after all -- but he's absolutely right to criticize us for grouping all wine competitions together. There are now so many wine competitions across the country, and for us to imply that their standards are all the same was unfair. With that in mind, let's do something we should have done the first time around. Let's highlight some of the best examples of wine judging competitions. Robert Whitley, of the excellent website Wine Review Online, is helping set new standards for wine competition websites. First, though, he deserves praise for his innovative approach to wine competitions: Whitley runs several events and each event features judges from a singular field. There is the Sommelier Challenge, the Critics Challenge and the Winemaker Challenge. Each website has a complete list of judges. Then, each website not only lists the results, but lists which particular judge contributed which medals, including comments and some tasting notes. The wineries are listed alphabetically, allowing readers to see which of their wines won medals. Whitley has answered every question I've had and our disagreements have been spirited and pleasant. I encourage you to check out WRO regularly, too -- there is a fine list of writers there including Tina Caputo, who penned this pithy dissent to our original post. Dan Berger runs two competitions in California, and in my communication with Dan, I can say I know of no one more meticulous about the details of their events than Dan is about his. You have to admire his insistence on four-judge panels instead of the often-used 5-person, majority rules system (he demands discussion from his judges). And who can't appreciate a wine competition that gives out a Terroir Award? Christopher Cook demonstrates what makes for the strongest competition directors: He's careful about the order of the wines poured and tasted, taking into varieties, sugar level, and the sheer volume of wine to be tasted by his judges. He runs the Michigan Wine Competition. Doug Frost is one of my favorite wine people anywhere in the world. If you've somehow not heard of him, watch this video and tell me you don't love his style. Doug is the rare person who can go utterly erudite and intellectual about wine (he's one of three people in the world to have passed the Master Sommelier exam while also earning Master of Wine status) and is also capable of speaking to first-time drinkers in a real, connectible fashion. He directs the Jefferson Cup, and the website lists not only recent winners, but all winners for the past five years. One concern we have with competitions run by this estimable group -- and this seems to relate to all wine competitions, best we can tell -- is that consumers can not find out which wines were submitted and judged not to be worthy of medals. Only the list of medal-winning wines are accessible, and generally more than half the wines submitted to competitions win medals. So the list of wines deemed unworthy of a medal would not be overbearingly long to publish, but I've been told that publishing that list would be embarrassing to the wineries who made those wines. Our view is that consumers who trust judges to help them choose medal-winning wines would also want to trust judges to help them avoid spending money on unworthy wines. I sent him a short list of questions, including the following: Research has indicated that palate fatigue sets in after about a dozen wines. How do judges counter that -- or can it be countered? To that question, he sent a short response, reprinted in full: "I have never seen such research, and believe strongly that palate fatigue is a myth. If such research has been done, can you cite where you found it and who did it?" More on the research in a moment. The only other writer I had ever heard refer to palate fatigue as "a myth" was Jay Miller of the Wine Advocate. Miller has commented, "The palate fatigue argument, frankly, is total hogwash. You taste, you spit, you write a note, taste again, spit, add (or not to your note) and on to the next wine. When you’ve had practice doing this, it’s simply not difficult." Let's frame this discussion with a single, essential question: If the last wines of the day are judged with even a small decline in palate and olfactory freshness, is that fair? Or, if you prefer: Should we expect and require judges to have the same palate and olfactory freshness throughout the duration of the judging event? Several judges have correctly pointed out that with practice, tasters can condition themselves to last longer before feeling fatigue. And several judges have used the analogy of running a marathon: a 100-yard sprinter can't just run a marathon without training, but with preparation, he or she can become strong enough to finish. But this analogy doesn't exactly work because even the most experienced marathon runners feel differently -- more tired -- toward the end of the race. The point of running a marathon is to finish the race, not to admire the scenery -- having just run a half-marathon Sunday, I can relate to that! The point of tasting a hundred wines or two hundred wines, though, isn't merely to finish tasting. You're supposed to admire the scenery, not just power through. That's why you're doing the exercise in the first place, to report back on what you saw (tasted). If you ask a marathon runner to give an architectural critique of the building he passed at the 25-mile mark (or the 1-mile mark or the 10), I doubt his answer will be as valuable as that of the person who strolled by, sat on the nearest park bench, and admired the building for an hour. So the useful question to ask is not whether it is physically possible to taste a hundred wines in one sitting, but whether tasting a hundred wines in one sitting adequately serves the original purpose of doing so: to evaluate them fairly and intelligently. Science and research tells us that just like the marathon runner losing pace and energy as the race progresses, palates do indeed get fatigued while tasting, and even our olfactory senses are affected. Let's look at the research. The University of Minnesota recently performed a study on the buildup of astringency in our mouths while tasting. Tannic wines have a lot of astringency, for example. Does it build up in our mouths? Can we counteract that by eating bread or drinking water? I encourage you to read this study. The researchers used a handful of palate cleansers to see if they could "clear up" the buildup of astringency or tannins. Those palate cleansers included water, carboxymethylcellulose, crackers, milk, chewing wax or nothing. What they found is that it becomes increasingly difficult to clear the mouth after repeated exposure to tannins/astringency. And while some of the palate cleansers were better than others (water and doing nothing at all worked best! ), it is impossible to entirely avoid the buildup of astringency. I'd like to see olives, a popular cleanser, used in future studies. But, in other words, palate fatigue happens. If it can be mitigated, it can't be stopped. Every human is genetically different from every other human. Some people who are unskilled at tasting wine will find that they cannot distinguish much after 12 wines (as you indicated.) Others who are skilled at tasting wine can do a creditable if not exemplary job tasting 100 or more wines a day, at a very high level of acuity. It depends on the ability of the palate to be sufficiently trained as well as other factors (which I alluded to in an earlier message about saliva regeneration, for example). I, for instance, can taste well over 100 wines without a huge drop-off of skill. It depends to a great degree on how that tasting is conducted. I once did 252 Chardonnays on one day, no thanks to the organizer of the San Francisco Wine Competition, and did what I think was a good job. (But the format of the event was vital to me saying this,.) But would it have been better had I done that number of wines in a four-day period? Well, that all depends. What if I had a cold on the fourth day? What if my "biorhythms" were off on one of the days? Does the mental state of the taster have anything to do with this? Of course. And not all Mondays are equal to all Tuesdays. So though palate fatigue for some people is related to their skills, others may be saying that they are suffering from palate fatigue when it is mental fatigue that's at play. Alexis Herschkowitsch, who co-wrote a book called The Wine Trials, says, "For some people, it’s easy to plow through a lot of wines, but others get palate fatigue. Palate fatigue hits all of us differently.” So by saying that palate fatigue is a myth, I refer to the fact that you can't prove it exists or doesn't exist. Something's at play, but what exactly it is cannot be stated with any certainty. Perhaps the format of the judging is what's causing a deterioration in the ability to detect a wine's characteristics properly. It's not just our mouths that will be affected by large tasting formats. Research shows that what we perceive in a wine's aromatics will be impacted by what we've previously smelled. Think of it this way: Someone with 20 cats gets accustomed to the smell of cat litter -- it no longer registers with them. That's adaptation. In a flight of 12 red wines that are heavily oaked, the first wine will seem oaky. By the final wine, the impact of the oak on the nose will be much different. And that's just the extreme example. Slate's Mike Steinberger visited the Monell Chemical Senses Center in Philadelphia, where he met Dr. Charles Wysocki, an expert on olfaction. Steinberger wrote, "Wysocki expressed admiration for the stamina, aroma-identification skills, and descriptive abilities of wine critics, but he was skeptical about some aspects of the trade. He said it's impossible to taste dozens of wines in rapid succession and not suffer olfactory fatigue and that anyone who claims otherwise is claiming to 'defy biology,' as he put it. Although a critic might think that his sense of smell is still acute after sampling 40 Cabernets, his impressions at that point are being formed less by the nose than by past experience, visual cues (such as the color of the wines), and perhaps also tactile sensations." First let's look at The good doctor, who is quoted as saying it's "impossible to taste dozens of wines in rapid succession." I assume that that the term "rapid succession" means one wine after another. But if there is a 90-second to two-minute break between the wines, is that sufficient time for the nose to regenerate? There was a sensory specialist at UC Davis, the late Rosemary Pangborn, who did a lot of research on this and found that 90 seconds was needed between wines for the nose to regenerate all (or substantially all) of its capabilities. Moreover, your example of heavily oaked wine seems apt until you look at what constitutes a judge's evaluation of wine in terms only of the oak. If an oaky wine is deemed excellent because of the oak, then the last wines in a group of 20 (your example) will taste less oaky and therefore not as appealing to an oak-loving judge. And vice versa for the oak-hating judge. So ideally we should look at wines that are balanced versus unbalanced, and there we get into a real can of worms. Great judges look for a balance. I have taken the liberty of attaching a recent commentary on the subject of complexity. Great judges seek complexity. Those who cherish fruit (even in overripe forms) do not care about complexity as much and aren't great judges. They are simplists. I followed up to ask Mr. Berger is he instructs his judges to wait 90 seconds between wines during a judging event, as I have never seen that practice employed. I have not heard back from him about that. We don't hide the fact that we view blind tasting as an extremely useful component in evaluating wine -- but only a component. Beauty is difficult to discern in large tasting formats. Add to that the challenge of dealing with palate and olfactory fatigue, and it's a concern. As Howard Goldberg has noted, we're not the well-known names that command respect in wine writing. But there are some outstanding and respected writers who cite palate fatigue as a real concern in such formats. Steve Heimoff, author and longtime California-based wine writer for Wine Enthusiast, says, "I used to power-taste until I realized it wasn’t fair to the wines or to me. The palate gets fatigued and can only respond to the biggest, most extracted wines. Subtlety is lost. Perhaps that’s why Parker gives his highest scores to the biggest wines. Nowadays I limit myself to about 12 wines a day, and actually have the time to think about each one, the way it deserves to be considered." Charlie Olken, the man behind the outstanding Connoisseurs' Guide to California Wine, tells me, "Those events are, to my way of thinking, exercises in futility. I simply do not believe that most tasters, even professional tasters like Dan Berger and myself, can sit through a tasting of 120 Sauvignon Blancs or 75 Petite Sirahs, etc. and make defensible decisions. I come to that position having subjected myself to plenty of those events in the past. I wound up tired, bored, burned out and eventually at odds with the selections of wines that stood out because they were different, not better." Joel Goldberg, Editor of MichWine.com and a judge at the Michigan Wine Competition, says, "Not only is palate fatigue an issue, so is alcohol absorption through tongue and mouth, even spitting everything." Regarding blind tasting as its own measure of a wine's quality, Mr. Steinberger writes, "Tasting blind doesn't necessarily make for better wine criticism. If you don't know the wine's name, you also don't know its back story -- how it was made and how it has tended to evolve in prior vintages. These are important considerations, particularly when appraising younger wines." Eric Asimov, New York Times chief wine critic (and almost no introduction needed), writes, "Maybe as wine drinkers we’re all a little more grown up now and don’t need to taste blind all the time. We’re not going to set aside blind tasting. At least, not yet. But I think it’s time to consider whether it’s always the best way to judge wines. Consider the question asked." Terry Theise, importer, rogue thinker and author of the new book Reading Between the Wines, writes, "What is the value of reducing wine to a thing without context? What game is this we're insisting wine play along with? What's the good of tasting blind? Where's the silver lining of experiencing wine in a vacuum? Yes, it can train us to focus our palates and hone our powers of concentration. Then we can discard it! It has served its purpose. If we persist in tasting blind we run a grave risk -- because it is homicidal to a wine's context, and wine without context is bereft of meaning... Blind tasting will confuse you as to the purpose of drinking wine. The only genuinely professional approach to wine is to know as much about it as possible. Who made it, under what conditions, what are the track records of the site and the vintner -- then and only then can a genuinely thoughtful evaluation of a wine take place in the fullness of its being." Alder Yarrow, creator of Vinography (one of the top wine blogs), supports large blind tastings but hates the medal system. Alder has called wine competitions "one big racket" and "vaguely evil." But he recently judged in a competition with no medals that allowed the public to choose the category winners. To be fair, Thomas Matthews, of Wine Spectator, says, "Blind tasting may not always be the best way to understand a wine, and it is often humbling, even for the most experienced tasters, but I think it is the most objective method of evaluating one." Contrary to what some judges have said, we are not out to discredit wine competitions. In fact, in light of the challenges posed by factors like palate fatigue, we're impressed by the careful approaches taken by some of the best competitions in the country. These competitions deserve praise, not derision, for their efforts. Everyone will have a different standard to view these events. If we find it unfair that not all wines judged will be evaluated with the same clear palate and nose, then it seems that these events are fundamentally unfair to the wines entered -- through no fault of the hard-working judges. As Dr. Wysocki notes, it's impossible to defy biology. And no matter how much judges want to insist they can withstand the palate assault of dozens or hundreds of wines, there are undeniable effects. But it's more nuanced than dismissing competitions because not all wines are judged with the same acuity. The best competitions build in breaks and take measures to mitigate fatigue. It's fair to say that while the judges will suffer from some fatigue, they do good work under the circumstances. Would we judge, knowing that no matter the training, we would experience the kind of fatigue that would prevent us from bringing the same fresh approach to the final wine as we had for the first? We would not. But do we condemn judges for making the effort, for putting in the time, and for doing the job? Absolutely not. We hope this discussion does more to educate consumers about the process and its challenges. We'd still like to see competitions release the full list of wines entered; they should have nothing to fear if they want consumers to value the full results. But make no mistake: When it comes to wine competition directors and judges, they have earned the respect for this work, and they certainly have it from us. This weekend HARVEST EAST END, a wine auction and celebration of Long Island's East End, will take over wine country on both forks to benefit the Peconic Land Trust and East End Hospice. The event has been organized by the Long Island Merlot Alliance and Long Island Wine Council with support from the New York Wine & Grape Foundation. The day-plus event kicks off on Friday with ten 10-Mile Dinners, which take place at private locations -- homes, yachts, etc. -- with locally sourced food cooked by a local chef and hosted by a local winemaker. Tickets are $350. See the list of dinners. If $350 is too much for you (like it is me), you should check out The Wine Salon, a series of programs at various wineries on Saturday morning and early afternoon that are only $25. They range from wine and food pairing to sessions about growing grapes to information about differnet grape clones to simply how to taste wine better. See the full list of sessions. Later in teh afternoon, the event moves exclusively to Wolffer Estate in Sagaponack. From 4 - 7:30 p.m. is the Festival Tasting of Long Island’s Bounty ($125), which is a grand tasting of Long Island wines, including wines to be offered at auction, accompanied by small plates of local, seasonal dishes by East End chefs partnered with farmers and food artisans. There will also be a silent auction of regional treasures. 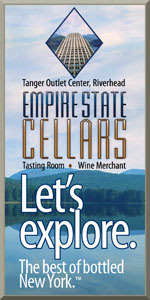 See the list of wineries and restaurants involved. And, saving the biggest and no-doubt best for last, the Gala Dinner & Live Auction will start at 7 p.m. This portion of the event is sold out, but will includ a world-class, farm-to-table dinner created by premier East End chefs Keith Luce, Gerry Hayden and Claudia Fleming. The auction is going to be a first for the region, and there are some ridiculously extravagent lots, including many half-barrels of wine, artwork, wine experiences and more. Learn more about the auction. Fall is in the air in a big way here in western New York, and as far as I’m concerned, fall is beer season. Oktoberfests, pumpkin ales, harvest ales, bocks…the styles brewed during this time of year are some of the most delicious and exciting in the beer world. I tasted two Oktoberfest beers of note this week: one from Buffalo’s recently reopened brewery Flying Bison Brewing Company, the other made across the state at Brooklyn Brewery. I enjoyed both beers outside, in the crisp fall weather, with an appropriately large sweater and snacks involving obscene amounts of peanut butter and pretzels. Flying Bison specializes in traditional German beers, and this may be their strongest offering. Only offered on draught, I enjoyed this beer from a growler filled at the brewery and again a few days later at Buffalo Brewpub. Poured into a pint glass it shows lovely two-finger head atop a beautiful russet-brown body, with a light web of lacing. The nose of roasted Heath bar and peanut butter malt, along with hints of apricot and nutmeg, gives way to a full, chewy mouthfeel with delicate carbonation and only a whisper of hops. An extremely pleasurable quaffer, this would be a great match for any bratwurst entrée, but I enjoyed it thoroughly with peanut butter pretzel sandwiches. Brooklyn’s Oktoberfest, sampled from a 12 oz. bottle, is another fall treat. A deep brown color with an attractive three-finger head poured into a pint glass, the nose shows toasty hazelnut, cinnamon and freshly baked bread. On the palate it’s slightly more assertive than the Flying Bison: a little more carbonation, a little sweeter, and most notably a little more hoppy. It’s the crisp subtlety of noble hops though, no resin or greenness, and the acidity of the hops and carbonation makes this beer a great pairing for a hearty sauerbraten or wiener schnitzel. These beers are packed with that feeling, and light enough (both under 6% ABV) to drink all afternoon while tailgating, camping or rewarding yourself for a leaf-raking blitz. Two brews with a sense of occasion and a gorgeously old-world sensibility.